Carrying water on the trail is only half of the equation. In many places we hike, at least in western countries, we take for granted we will have access to good quality supplies of clean water right? While the answer is usually yes this is not a guarantee and what we see is not necessarily all that we get. I travelled through India a few years ago and managed to pick up a case of Giardia that took me six weeks on a fairly strong course of antibiotics to get rid of; an experience that I never want to repeat. Don’t be fooled here, Giardia exists in Australia and there have even been outbreaks in town water sources. As a result of this I am extremely cautious when collecting water on the trail and no matter how clear the water may appear, I will always use some form of water treatment just to be on the safe side. Using chemicals to treat water is by far the lightest option for the ultralight hiker but as always there are drawbacks. 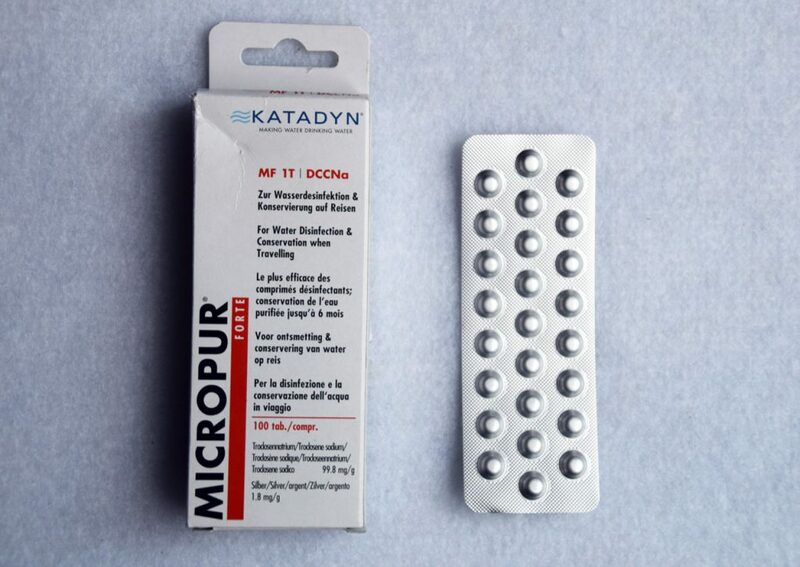 The Katadyn Micropur Forte Water Purification Tablets (along with the liquid version) is the most commonly available chemical water treatment for hikers in Australia. Brands like Aquamira also exist but most specialist outdoor stores seem to opt for the Katadyn products. These tablets work by chemically killing of any biological nasties in the water. The tablet version is the easiest to use; just add one tablet per litre and wait for 30 minutes before drinking (for viruses and bacteria) or two hours for Giardia. So while this is a great water purification option if you only have one container then you had better hope that you are not very thirsty otherwise you may find yourself taking a risk. As an example if you drink four litres of water per day the packet of 100 tablets will last 25 days. For people like me, paranoid about Giardia, this means I would operate with at least two bladders and drink from one while the other is being treated. Once treated the water is good to use for up to six months. Apart from the length of time required to treat the water the other main issue is that it doesn’t get rid of any solids in the water which means that you may end up with gritty water or food. To solve this issue pre filter with either a sieve filter that you can by from the outdoor stores or use a buff to pass the water through to pick up any chunky bits. One other issue people often don’t think about with this product is cost. If you are like me and always filter/purify the water this product, while costing less than 38 cents a litre to treat, it can add up. I would easily consume around 1000 litres a year while hiking so using this option would add up to nearly $380 AUD per year which starts making products like the MSR Guardian Purifier t nearly $600 AUD look cost effective in the long run considering it also gets rid of the chunky bits as well. For me these tables tend to be used as a back up to my main filtration system which is currently the Sawyer Mini, and I will always take this product with me overseas particularly in Asia and South America where viruses are a concern. NOTE: You can buy water purification tablets from larger chemists and the price is often much more competitive than from the outdoor stores.